Fabulous stools -- loved them so much that we bought 6 of the matching chairs to go with our breakfast room table. Amazingly comfortable --and very durable. Just the look we wanted in our remodeled kitchen! 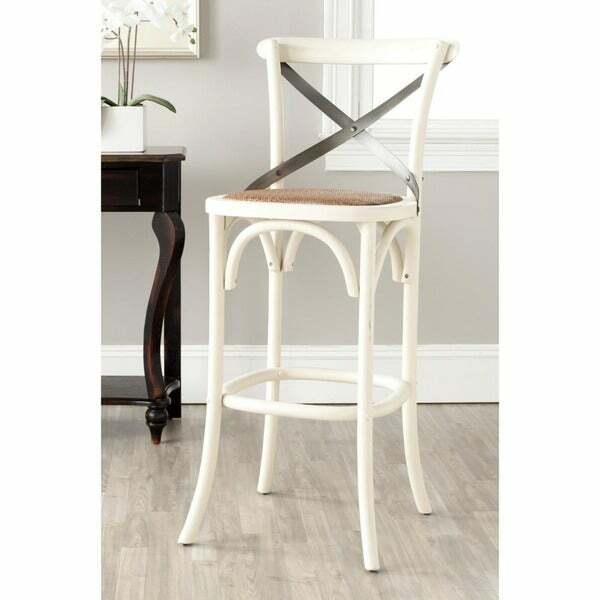 Safavieh 30.7-inch Eleanor Ivory Oak Bar Stool - 20.1" x 20.1" x 43.7"
Bring the classic Thonet look to your home decor with the EleanorX-back barstool. This Safavieh barstool features an ivory-finishedoak with a graceful frame, rattan seat and an authentic cross-backarch brace in black metal. Dimensions 44.1 in. H. x 19.7 in. W. x 21.9 in D.
Really like the dark metal backs! Lots of compliments! Very sturdy and comfy! nice seats too! These bar stools are great! The ivory color looks perfect at the bar between my living room and kitchen. I especially love the weight of these chairs. I have them on a laminate wood flooring and because they are lightweight, I don't have to worry about them scratching the floor. They are very comfortable and the perfect height. Packaging was a bit insufficient and I did have to get several replacement chairs due to some damage during shipping. But as always, Overstock made it right. I highly recommend! 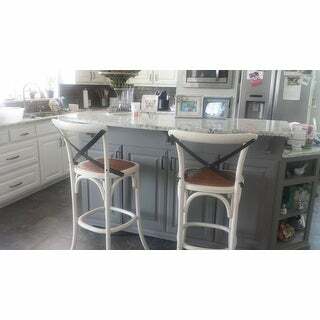 It is a sturdy, great looking stool which goes well with our new kitchen remodel -- and the prices is the best we have found. They match my kitchen table.